Check the live page for details of all the shows coming up and links to buy tickets. Saturday April 10th. Doors 8pm. I've put the mix CD I gave out at Plastic People in London last month up on Soundcloud for people to check out who couldn't make it down to get a copy. I've seen it going up on loads of blogs so I thought I might as well share as well. Full details on the Fabric website: http://www.fabriclondon.com/club/listings/ And they've got Todd Edwards and Joy Orbison there this week which should be good. Pantha Du Prince, Nathan Fake and Rocketnumbernine are going to be joining me for various dates on my UK tour next March, and Joy Orbison at the London show in February. Details of who is playing where is on the flyer below. These are all acts that I'm a big fan of. Pantha Du Prince has a great new album coming out early next year that is really wonderful. Rocketnumbernine are a synth and drums due from London. Nathan Fake is also doing all my North American dates in February. Check out all the myspace links below too. On December 11th I'll be doing the last night of a DJ residency I've had at Plastic People in London for the last year or so. As a thank you to the people who have been coming down I've made a mix CD of some of the tracks that I've been playing at those nights and a free copy will be given to everyone who comes through the door for this last session. This will not be for sale anywhere and is just for this one night. A lot of the music on the new Four Tet album was tested out at these Plastic People nights and this club is a big inspiration to me. Look forward to seeing you there on the 11th. 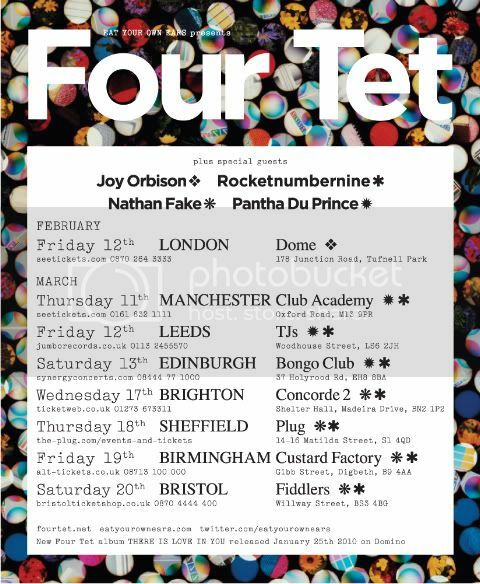 Have just added a date in Sheffield to the UK tour. I'll be at the Plug on March 18th. All the dates for that tour are listed on the live page of this site. Still working out the support acts for this tour but hope to have something to announce soon. I've also just confirmed a DJ date in Barcelona on 23rd January. 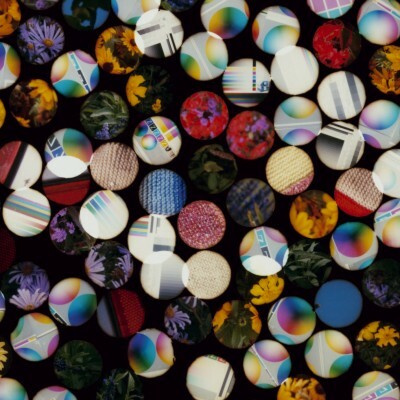 Here is a preview of some of the artwork for the new Four Tet album coming out in January 2010. This image is the front of the CD version. There will be different images for the vinyl release and hopefully for the digital release as well. As always the artwork has been done by Jason Evans and Matthew Cooper.